I recently had a discussion with my friend, Ninette, about the essence of what makes a house a home. The best way I know to describe what I want to embody in my own home is heart and soul. While I admire beautifully decorated model homes with nothing out of place and every nook and cranny picture-perfect, I could never live like that. To me, that scenario is just a house. So what transforms a house into a home? I believe it to be the essence of heart and soul that permeates like a perfume. I visualize God’s massive hands encircling the bricks and mortar that make the structure, breathing life, love, comfort, peace and memories into it. The very definition of soul is the spirit or immaterial part of something. Usually this refers to a person, but I know my home has a soul in the spiritual sense of the word. People without a soul become evil, dispassionate and vindictive. A home without a soul reeks of disuse, is often in chaos and disarray. Things get broken and discarded in a home without soul and so do the people who inhabit it. The heart and soul of a home encompasses everything from the people who live in it, to the way it is furnished and decorated, to the feeling a stranger gets when he enters the door. The smell, the sound, the feel, the look. All those things that we, as humans, become immediately comforted or repelled by. When we moved onto our property over 18 years ago, we had come out of a 12-year long desert, digging out of the financial hole we had gotten into. We felt unbelievably blessed to have a place of our own. We walked around and around our acres and thanked God for making it possible. We asked that God help us bless others with our home and land. And we are always amazed and thankful that those who enter the lane to our home comment they feel peace and love as soon as they enter. I like to think God is breathing peace into their soul and love into their heart just by visiting us. How you can incorporate heart and soul into your home can best be illustrated by thinking of the five senses. In my book, Creating a Haven of Peace , I talk about this concept and how to lay the foundation for a Sanctuary where family and friends want to hang. I have it on sale for only $10 through December. 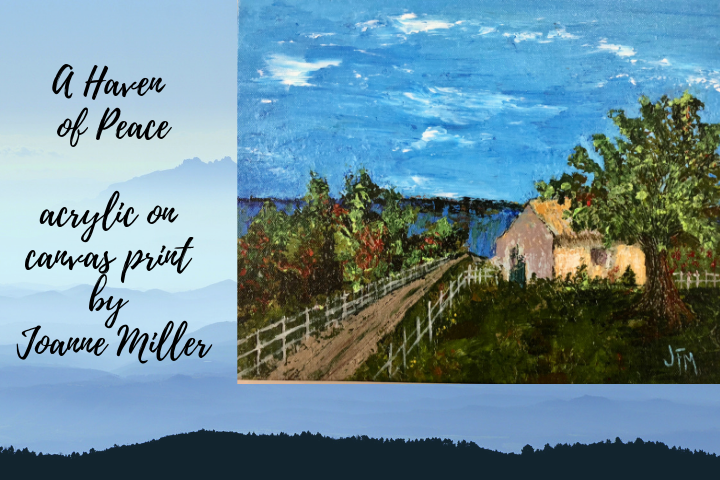 Pare it with my rendition of a peaceful sanctuary (mentioned below) makes a wonderful Christmas gift for a loved one. It is my sincere hope and prayer that your home will become the very essence of heart and soul, not just during holiday time, but every day of the year! The photo above is my Haven of Peace painting. I painted the original with palette knife and acrylic. You can buy a giclee print on canvas, gallery wrapped, and ready to hang, through December for only $55. It is 10″ x 12″. Order yours here. Beautiful! Thank you for sharing!! So very true Joanne! Your home is a true sanctuary in every sense of the word!